Tomorrow, Saturday 7th December 2013, is Small Business Saturday UK, where everyone is asked to support all Small Businesses across the UK on one of the busiest days of December. Whether you buy a sausage from the butcher rather than a supermarket giant or use your local garage over a main dealer, it ALL makes a difference! Free sparkles? Really? Yes! Really! We have an exciting new brochure host opportunity for our fabulous customers or indeed anyone familiar with our gorgeous products! The brochure contains many new items not available via the website & all you have to do is request a pack! It's kind of like having an 'At Home' party except you don't have the outlay of the nibbles & drinks & the frustration when 20 invited friends turns out to be 4!! How many times has that happened to us all!! Grrrrr! The pack has a few brochures & several order forms in it & all you have to do is give them to your friends & family in the playground, in the staff room, at toddler group, over coffee, in fact anywhere you meet up with people!! It really is that easy! We've been trialling this the past few weeks & the feedback so far is that our Brochure Hosts have all been amazed at how easily the products sell themselves & how quickly they have turned the sales into free products with very little effort! We recommend you book your pack for 2 weeks so that you have time to hand them out as many times as you can and if you would like them longer, just let us know! Once we receive your pack & orders back, we ship everything back to you to distribute, including of course your lovely free sparkles! Your friends & family are super delighted & you gain all the host rewards of an 'At Home' party, without any of the hassle!! It really is simples! Get in touch for more info on the rewards structure & to book your brochure date! P.S For Christmas deliveries, last brochures will need to be back by 8th December so please bear this in mind when booking your date! Being a parent whilst juggling a business is a hard task, and nobody knows this better than Miki Pinder. Miki, a mother of 2 from Gillingham, Dorset, runs Sunshine & Daises, an online store retailing Swarovski Wine Glass Charms & Gifts. The business was launched in 2006 as a way for Miki to stay at home with her young children. She has been nominated for an award at The Mumpreneur Awards 2013, a national award scheme for mums who run their own enterprise. The Mumpreneur Awards 2013 are the UK's first national business awards dedicated solely to mums in business. Now in its fifth year, the awards have been a platform for many mumpreneurs to enhance their business, and continue to grow even through this uncertain economic climate. As well as being nominated in the Best Online Business & Best Mumpreneur Product categories, Miki is also in with a chance of winning The Inspirational Business Mum Award, which will be awarded to the mother who proves to be an inspiration to all women in business. Miki now has to wait until the beginning of September, when she will find out whether she has made the finals, which will be taking place on 28th September 2013 at The Holiday Inn, Birmingham. Mumpreneur UK is a leading support network for mums in business, and provides online resources and support as well as an annual conference and awards ceremony. Visit www.mumpreneuruk.com to discover more. Hen Nights, Party Time & Dinner Dates!! Its been a busy few months here at Sparkle HQ with our wedding bookings & we're pleased to report that they all went out smoothly & as planned. Our brides-to-be have been fabulous & amazed us with their calmness & preparation. We're soooo looking forward to seeing the photos!! These past couple of weeks have seen some last minute orders for hen nights, a 60th party & a private dinner party! We've been only too happy to assist & sparkled away to get the parcels off ahead of time. There's been some beautiful & very different colour schemes this year, always inspiring for us. If you're thinking about an upcoming event & are looking for something different or just want some ideas, do drop us a line. We don't charge a penny for quotes & we're more than happy to help you with ideas & send pictures if you want to see your thoughts come alive. 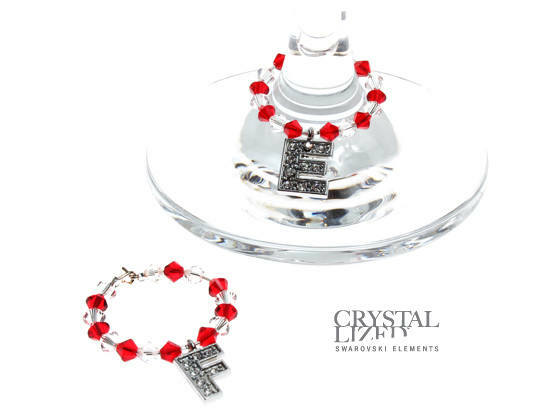 We hold thousands of Swarovski crystals in stock along with hundreds of charms so we really can help you speedily, whether its a party for 12 or an event for 500. If your event is further ahead, we are more than happy to begin discussions with you and provide a quote based on a design you like. We then guarantee that price with only a £50 deposit & can discuss exact colours & finer details nearer the time giving you flexibility, but safe in the knowledge your cost is now fixed. We look forward to sharing the sparkle pictures of events gone by as they come in & to welcoming our new clients for an informal chatter. We LOVE & I mean LOVE getting your emails & wonderful comments about how much you love your sparkles & we always put them up onto our customer reviews section as soon as we can. You'll know we are also lucky enough to be asked to sparkle many many events each year and I've blogged before about how we wave off the boxes of sparklies with excitement (& quite often, butterflies)!! Every now & then, we get one or 2 pics back that make us smile enormously & the email that came through last night did just this! Nicole booked us last summer to sparkle her stems for her wedding & its the 1st ever wedding we've done in Swarovski Peridot & Pearls so it was always going to be special!! 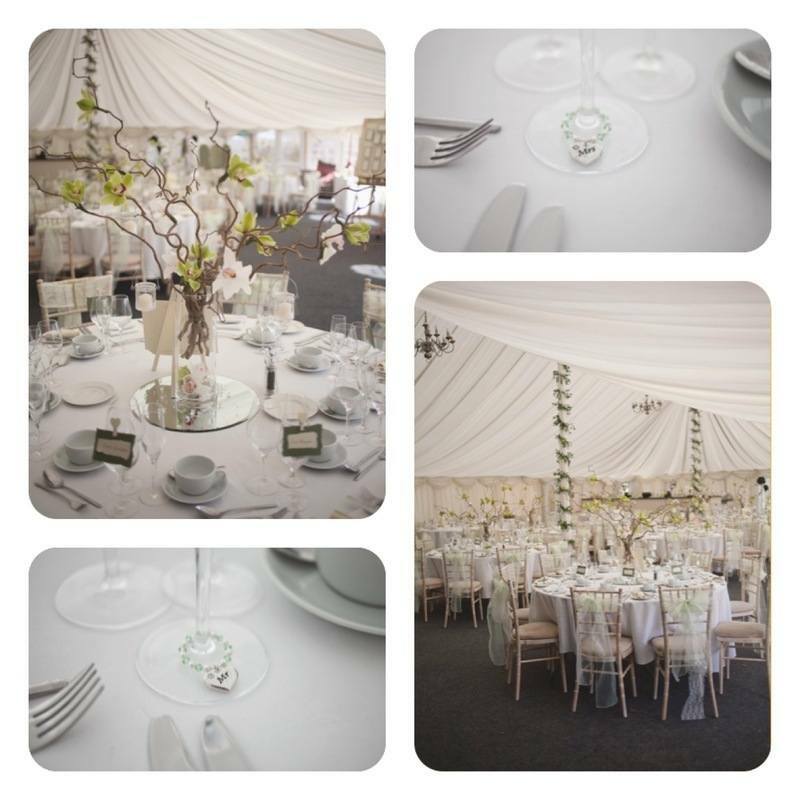 We think you'll agree that the colour scheme is just stunning & its so refreshing to see something different. We love how fresh it looks & its just perfect for a spring wedding. 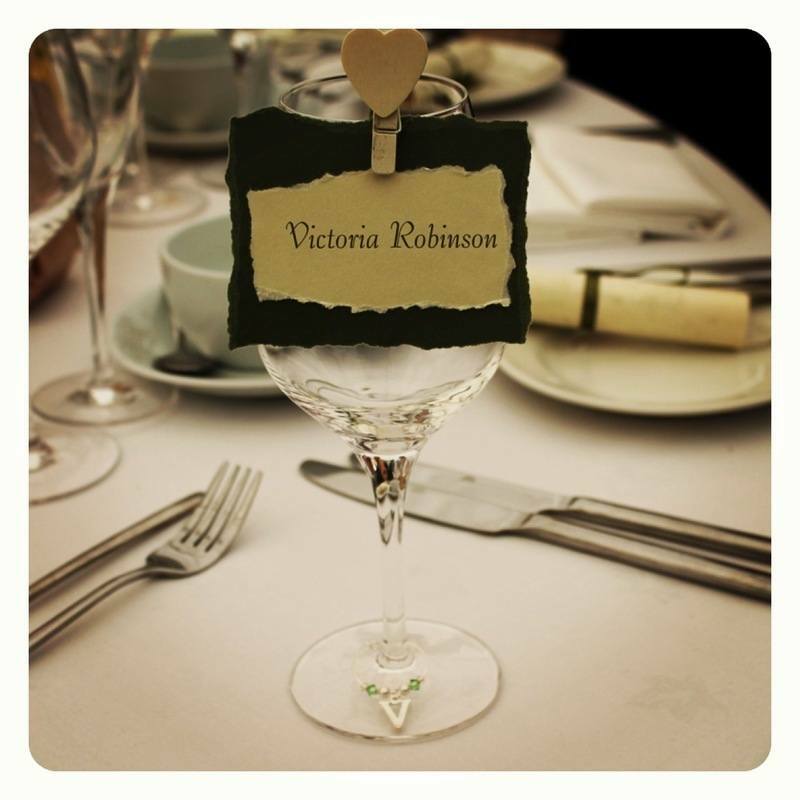 Nicole chose a demi wine glass charm in Swarovski peridot crystal with Swarovski white pearls & each guests initial in silver. The bride & groom then had luxury full circle wine charms in matching colours & with Mr & Mrs silver hearts. 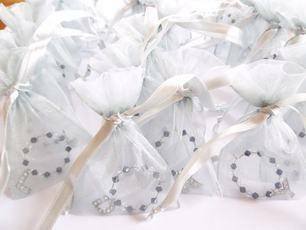 The wine charms were then placed on the glass stems as table decoration & the guests could take them away in organza bags as a keepsake of their day. Totally unique to Nicole & Paul & completely personal to each of their guests! I thought I'd just send you a photo or five of the wine charms in situ at our wedding. We had THE MOST AMAZING DAY. It was utterly perfect, even the sun came out! Everyone loved the wine charms! We use our Mr and Mrs every time we have a glass of wine (that's near daily!). Nicole has also been asked to write a blog & we may have a little mention in it, so I promise to share it as soon as possible!! All our quotes for event orders are totally free & with unlimited revisions, so please do get in touch! If you decide to go ahead, you can secure your quote with just a £50 deposit & we then liase with you nearer the date to finalise all the details. We also love updates about your hen night(s), shoe dilemas & gown strap hunts!! Because we love to chatter, we also have access to some of the best & most lovely wedding peoples across the UK so we can sometimes help out with any last minute searches or at least point you in the direction of someone who can assist!! Keep sharing the sparkles & please keep sending in your pictures......we LOVE them!! 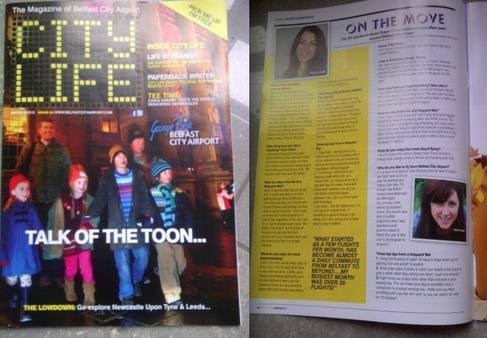 Featured in Belfast Airport's City Life Magazine! How exciting to be in Belfast Airport's City Life Magazine! Miki has been featured in the Frequent Flyer section of the latest quarterly mag & judging by the airmiles clocked up these past few weeks, its well deserved!! WOW!! How happy are we here at Sparkle HQ? VERY HAPPY is the answer!! The beautiful Fred & Evie has been reviewed by the panel at Mumpreneur UK for their Valentines Gifts Feature & guess what? We got the top award of 5 stars!! Fred & Evie are available at just £11.95 per set of 2 including UK delivery. They can be completely personalised with your choice of 2 initials & any colour within our Swarovski House Colours. Really lovely details and quality made! They are beautifully presented so make the perfect gift. I would certainly recommend and will be purchasing more. Well done Fred & Evie!!! 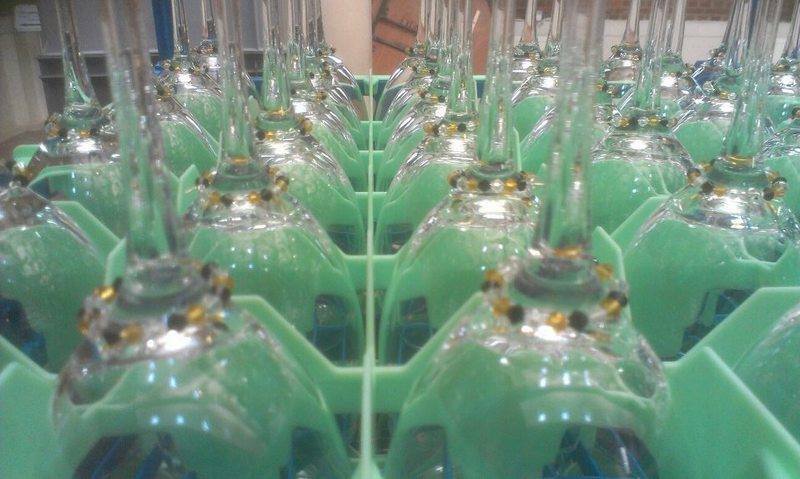 Win a set of wine glass charms!! It's A Murder Mystery Sparkle Up!! Gorgeous New Tea Towel Designs Now In Stock! Win a set of Swarovski Wine Glass Charms & Sparkle Your Stems!! 10% OFF FOR 1 WEEK ONLY!! More new designs now live!! Vote for us in the Great Exhibition's Best In Britain 2012 awards! WW Business Network Business of the Day! No/. 37 in the UK Follow Friday Rankings!! Pearlesque - Our second addition this month! Ice Drop - Our latest little stunner! Number 4 in The Top 100 Wedding Tweeters! New Website Design goes live!! New Wine Glass Charm Images! New Luxury Wine Glass Charm Designs!! Swarovski Jewellery Collection goes Live! LIMITED EDITION Wine Glass Charms - Vintage Tea Party!! Featured as the 1st Business Spotlight! Wine Glass Charms & How Can I Use Them For My Event? © Copyright Sunshine & Daisies 2019. All Rights Reserved.